Each week, you can nurture your toddler’s energy and creativity in a Kindermusik class designed for your child on the move! We understand that toddlers want to do it all, but really thrive most with your guidance and helping hand. So, we allow plenty of room for busy toddlers to explore and discover, to initiate their own ideas, and to respond in their own ways, while your active participation provides the security your child needs. As you play instruments, sing, and dance, you’ll uncover an engaging musical world while building your toddler’s conﬁdence, self-control, and early language skills. Up until about age 3, toddlers are mostly learning by observing and imitating others. That’s why the magical combination of parent and child with other adults in a Kindermusik class becomes one of the best kinds of opportunities for using music to fuel a child’s learning and development. Language Development – Your child is on the edge of a verbal explosion, and Kindermusik gives her lots of opportunities to practice and develop those budding language skills. Singing and vocal play along with Story Time, chants, and finger plays all help stimulate language development in a fun and pressure-free way. Vocal Development – For toddlers, learning to use their voices starts with imitating sounds, playing with the many sounds our voices can make, singing short songs, and chanting simple rhymes – all with you as a model and inspiration. 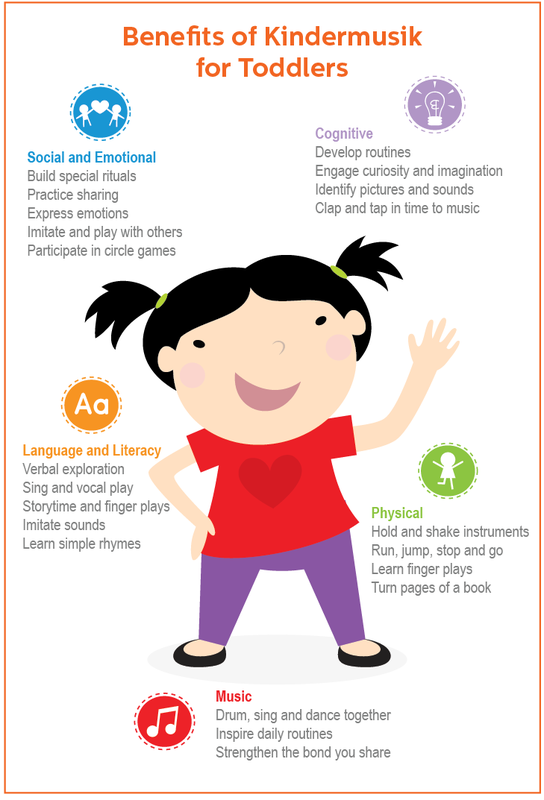 Cognitive Development – You’ll be able to enhance your child’s growing comprehension and cognitive skills through happy classroom routines like coming to get instruments and putting them away, musical activities that invite clapping and tapping to music, and themes that engage the toddler’s delightful sense of curiosity and imagination. Gross Motor Skills – Toddlers on the go love all their Kindermusik classes – we’re never still for very long! From holding and shaking instruments to running and jumping to stopping and going, you will enjoy being part of helping your child’s skills blossom through a wide variety of creative movement. Fine Motor Skills – At a child when your child is becoming more and more independent, a little practice with smaller-sized instruments, finger plays, and turning pages in a book means that the hand muscles learn to cooperate more and more with the brain. Social Emotional Development – There’s no doubt that your toddler is becoming his own little person, but he still needs you as his anchor of security. Kindermusik ensures your child’s healthy social and emotional development through predictable routines and special rituals, being around other children, practice with sharing, and best of all, play time with you. Musical Development – Toddlers are delighted by music, and there’s no better time than in these early years to inspire what will become a lifelong love for music. From drumming to singing to dancing together, you’ll love how Kindermusik inspires your daily routines and strengthens the bond you share. Junior Epics Music © 2019. All Rights Reserved.